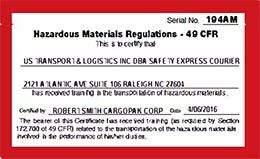 Safety Express Courier, based in Raleigh NC, has been providing courier services throughout the Southeast since 1941. We serve both business and individual clients. Although most of our services are provided to business clients, we also excel at providing courier services to individuals. Be assured that you will be treated in a professional manner at all times by our drivers and dispatchers. All of our employee dispatchers and drivers have a thorough background screening process performed before they begin work for our company. All of our drivers also pass a background screening by the US Department of Homeland Security. We deliberately take protective measures to ensure that our dispatchers and drivers have clean driving records, have no civil or criminal records of any sort, and are verified drug-free. All services provided are kept 100% confidential, we do not sell or share any of our clients’ information to any outside third party. This is our routine service. You can expect pick up to delivery to take approximately 3 hours to complete. This service is reserved for deliveries that must be picked up and delivered within 2 hours. We provide cross-state deliveries to Virginia, Tennessee, South Carolina, Georgia, Maryland, Pennsylvania, New Jersey, New York and the whole Southeast. Our fleet of vehicles is piloted by experienced drivers and it’s 24/7 at your disposal. We are able to deliver anything from small packages to large pallets of goods. We also work in partnership with larger nationwide courier companies by offering same-day service.